Our experienced and highly trained staff is eager to please and impress you from the moment you arrive at our office. We have created a friendly environment that we hope makes dentistry comfortable and enjoyable for you. Once you walk through the doors at Gallant Dental Group, our goal is to make sure you have nothing left to do but smile, smile, smile. Please check back as we update the website to include the bios of our office administrators, hygienists, and assistants. Dr. Richie Gallant was born and raised in St. Louis, MO. He graduated from Whitfield School and received his undergraduate degree from Vanderbilt University in Nashville, TN. After college, Dr. Gallant attended the University of Missouri – Kansas City where he received his Doctor of Dental Surgery degree. 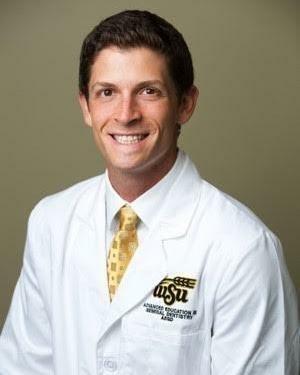 Dr. Gallant also completed a year-long Advanced Education in General Dentistry residency at Wichita State University where he learned advanced skills such as implant placement, bone grafting, and other advanced surgical techniques. Dr. Gallant is a member of the Academy of General Dentistry and International Congress of Oral Implantologists. He spends many hours a year receiving continuing education with the hopes of earning fellowship status in each of those organizations. Dr. Gallant’s journey to dental school started from his experience on the other side of the profession – as a patient. He was born without two of his front incisors and did not have them replaced until he was 17. He was fascinated by the process of replacing his missing teeth and how each dental specialist he visited played such an important role. What truly drew Dr. Gallant to dentistry was not just the effect the physical transformation having his teeth replaced had on him, but the emotional one as well. He knows first-hand what a complete and beautiful smile can do to improve one’s self-confidence and sense of self. That is something he carries with him each day and tries to impart on each of his patients. Dr. Gallant hopes that he can draw on his own personal dental experiences to help change your life for the better as well. In his personal life, Dr. Gallant enjoys being active. He is an avid runner, having completed many marathons and half marathons. He also enjoys golfing and bowling and spends his free time exploring St. Louis’ dog-friendly spots with his best friend, his yellow lab Henry. A big part of what brought Dr. Gallant back to his hometown is the opportunity to spend quality time with his parents, brother, and grandparents, all of whom live here in town. He hopes that a sense of family is what each patient feels when they walk through the doors of his office at Gallant Dental Group.